The bride’s walk down the aisle is always one of the highlights of a wedding ceremony, who should walk when to ensure your bridal march runs as smoothly as possible, the wedding-processional order can be confusing. Check out our ultimate guide below which were sorted out by our professional wedding planner team. – It’s the entrance marks the beginning of the ceremony and processional. Once she reaches the end of the aisle, she takes her seat to the left of the aisle in the first row. 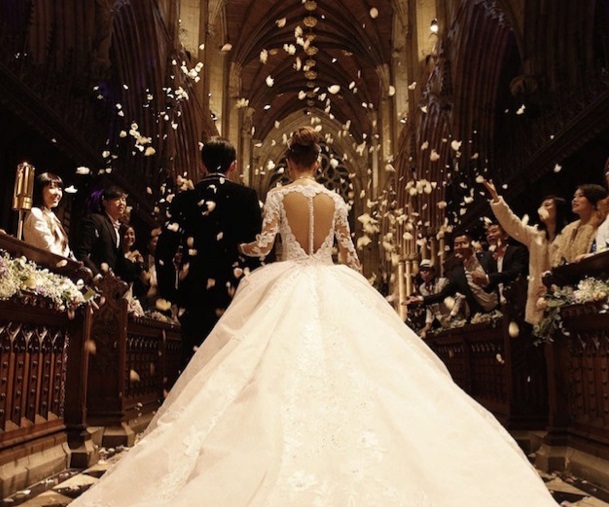 – In Hong Kong style’s wedding, most of the bride’s moms will not be involved in processional. The groomsmen can walk down the aisle one by one with the best man should go last. Or go arm-in-arm with the bridesmaids. The best man walks down the aisle after the groomsmen and stands at the groom’s side during the ceremony. He may also hold the bride’s ring or both rings. The groom will enter next, walking down the aisle solo. Or the groom enter the ceremony from the side of the venue, followed by his best man and groomsmen. Or stands right of the aisle in the front row. A very important part of the ceremony, he could enter from the side of the venue with the groom. Or invited by MC in most of HK weddings. She walks down the aisle after the bridesmaids and stands at the bride’s side during the ceremony. She may also hold the bride’s bouquet and sometimes the groom’s ring. The flower girl and ring bearer precede the bride down the aisle. The ring bearer carries the wedding rings tied to a small ring pillow. The flower girl carries a basket of petals, which she scatters as she walks. In tradition, the bride’s father escorts his daughter down the aisle, standing to her right. These day, he escorts his daughter down the aisle, “gives her away” to the groom, and then takes his seat beside the bride’s mother. For more information and creative march-in ideas, please contact with our professional wedding planner team. Have you ever thought about adding a little bit more than just your articles? I mean, what you say is fundamental and everything. However think about if you added some great pictures or videos to give your posts more, “pop”! Your content is excellent but with pics and video clips, this site could undeniably be one of the greatest in its field. Great blog! I don’t even know the way I ended up right here, but I thought this publish was once good. I do not recognize who you’re however definitely you are going to a famous blogger in case you aren’t already. Cheers!